VILNIUS, Lithuania — U.S. Secretary of State Hillary Clinton suggested Tuesday that the State Duma elections were neither free nor fair, and Germany urged Moscow to make democratic improvements. For a second day running, Clinton cited "serious concerns" about the elections, which observers said were tarnished by ballot-stuffing and other irregularities. "When authorities fail to prosecute those who attack people for exercising their rights or exposing abuses, they subvert justice and undermine the people's confidence in their governments," Clinton said in a speech at the meeting of the Organization for Security and Cooperation in Europe. "As we have seen in many places, and most recently in the Duma elections in Russia, elections that are neither free nor fair have the same effect," she added, in comments that went a step further than her criticism of the vote Monday. Clinton repeated U.S. concerns that Parnas was denied the right to register for the elections, and that observers such as the Golos election watchdog suffered cyber attacks. German Foreign Minister Guido Westerwelle said his country had noted with concern the reports received from election observers sent by the OSCE, Europe's biggest rights watchdog. "They show that the Russian Federation still has a way to go to fulfill all of the OSCE standards," he told the meeting. "We encourage the Russian Federation, also when considering the next elections in Russia, to move in that direction," he told the conference, referring to March's presidential vote. Swedish Foreign Minister Carl Bildt agreed. "It is hard to avoid the conclusion that this was not completely the free and fair election that I think the people of Russia also deserve," he told the meeting. U.S. Senator John McCain went further, warning on Twitter: "Dear Vlad, The Arab Spring is coming to a neighborhood near you." Many Russian political experts have dismissed suggestions that Putin could face an uprising in a country that has little tradition of major street protests. 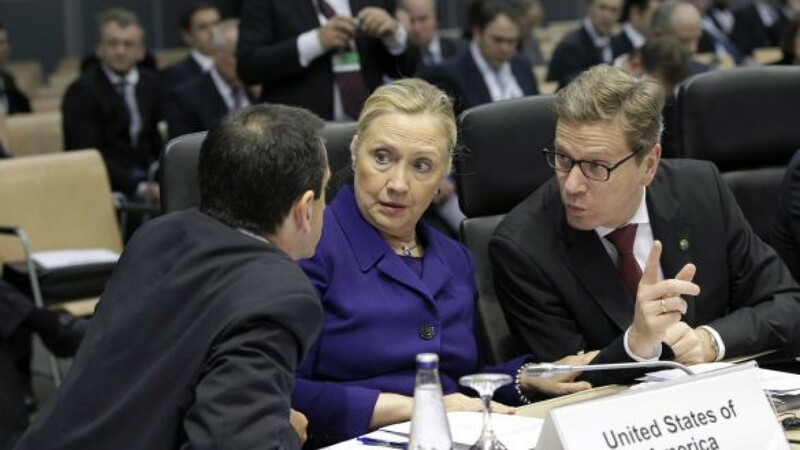 Clinton also kept up strong criticism of Belarus during her visit to the OSCE. "We recognize that this has been a brutally difficult year for the people of Belarus," Clinton told seven Belarussian activists she met on the sidelines of the OSCE meeting. "We continue to demand the unconditional release of all political prisoners," she added. In her speech to the OSCE, she said Ukraine prosecuted former Prime Minister Yulia Tymoshenko, who faces seven years in prison for abuse of office, for political reasons. The United States is pushing the OSCE, formed in the 1970s during the Cold War in part as a way for the Western and Soviet blocs to discuss human rights, to embrace a draft "Declaration on Fundamental Freedoms in the Digital Age." "Fundamental freedoms of expression, peaceful assembly, association and religion apply as much to a Twitter conversation and a gathering organized by NGOs on Facebook as they do to a demonstration in a public square," Clinton said. While she said 28 OSCE members support the declaration, it was unlikely it would be adopted by the organization, which operates by consensus. Russia and Belarus are both blocking the declaration, and other countries such as Turkey have reservations, diplomatic sources said. Europe's main elections monitoring group said Tuesday that it hoped to be able to oversee Russia's presidential election. "My strong hope is that it will not be long before we receive an invitation to observe Russia's presidential election," Janez Lenarcic, ODIHR's director, told a news conference on the sidelines of an OSCE ministerial meeting in the Lithuanian capital. Moscow's relations with the OSCE's vote-monitoring arm, the Office of Democratic Institutions and Human Rights, have been fraught since the group refused to send observers to the 2007 Duma elections, citing obstructions by authorities. The presidential election is due in March next year.